Two bloggers have started me thinking about polarities in the way we approach working on our BJP pages. Sharkeysday posted here about re-starting her February BJP page and about wanting to make her doll's chest less prominent. Well, I got to thinking about it. I can see her point... viewing it as a piece of art. Yes, she's right about that. Yet, from the point of view of telling a story, my story, about these words... about my mom and me, it's right on the money the way it is. With Mom so near the end of her life, I feel like I'm slipping off the page. I feel like the words which belong to our 67-year relationship are surrounding me, close to the surface, especially the word cry. I feel the need to experience these Mom-words as much as I can right now, because the opportunity to do so is changing. To my eyes, the piece better tells my truth (the way it is now) than it would if it complied better with the precepts of good art. That got me thinking about two polarities for our BJP pages... On one hand, we have making art and doing it right. At the other end of the scale, we have just doing it, letting it be what it is. Do It Right < - - - - - - - - - - - - - - - > Let it Be. Where are you on this scale right now? Where do you want to be??? Personally, I want to lean as far as possible toward the letting go side, because that is where I believe I will find who I really am as a person and as an artist; that is where I'll discover my own unique way to tell a story. After thinking about this, my new way to approach those times when I don't like my work will be to ask, "What does this tell me about myself, my feelings... what is the story here, what truth is showing up in my work?" It doesn't mean I won't check into all of the artists suggested by Kali, filling my subconscious with inspirations from the way they tell their stories. Nor does it mean I'll ignore principles of art. It's just that I won't force the principles in any way. They will be just one component of my subconscious process. I hope! Great post Robin. I was raised with a famous painter, my grandmother, Nan. She taught me, and my siblings art from the time we could hold a paint brush. Nan had certain ways of creating art. Instructed by some of the best world wide, she always had a critical eye of what was real or good art. We never did get on in this area. I was wild, in my art and she could not understand it. She lived to be 103 years old and died just two years ago. I was creating a series of dark and painful faces. (Due to my lifelong migraines) After all the years of being my Nan she still could not understand this art of mine. So everyone is on a different level. A different perspective of what is good, bad, or simply different. That old saying "Art is in the eye of the beholder" or "Art is a personal matter" are both true. I agree with you in that I never want to be ordinary, the same as, or complying to the so called rules. I am,just do it. Tell your story they way you feel it and see it. As I said in a previous comment. I love the piece just as it is. I understand it. I think you "hit the nail on the head" - and after thinking about it, you're right. Honestly I believe I get SO caught up in the 'doing it right" that I never finish anything. Thus, my goal of getting a piece done every month no matter what. I think I had lost the "no matter what" and that's my exploration this year. Cheers and thanks for refocusing me - and honestly that's why it's awesome to do this as a group! I like your piece the way it is. It has a nice flow and tells a story. I really lean towards the let it be what it is. Wikipedia defines art as "the process or product of deliberately arranging elements in a way that appeals to the senses or emotions" I think making your piece picture perfect would lose its emotional impact. i'm definitely in the "just do it and let it be" group. i have no formal art training...i just do what i feel is right at the moment. and when i'm done i hope that people who are both trained artists and just "doers" like me can appreciate what i've created. i completely understand the story behind your february piece and i think you've done it perfectly...it is you. I'm just a 'do it how I feel it' kinda girl! I sometimes feel guilty that I don't 'do' my art 'deep' enough..but I'm just not that 'deep' of a person. 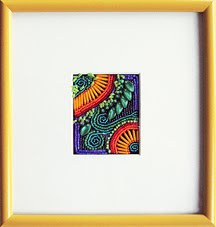 My art work is because I was inspired by a color, a piece of fabric or a bead..something inspires me but it's always a 'tactile' inspiration and not an emotional or deep thought inspiration. Whew! Glad I got that out! I feel better...now to go feel some beads or fabric! I took many courses on my way to a degree in art; and the rule I was taught repeatedly about creating art is that there are no rules. Hooray!! I'm definitely a "let it be" woman. If I waited until my work met all the proscribed art rules, I probably would never finish anything. The BJP has taught me to bead with my emotions. When I stop doing that, I have trouble with my pages. This projet is beading from the heart, from your depths, about what we think and feel and what we didn't know we thought or felt. Its kind of like Jungian interpretation of dreams. But the bottom line is that art is what the artist creates. If rules are important to their creative process, well its part of their art. Well, so far we seem to be a bunch of No-Rules gals! I chucked at Carol's last sentence... "If rules are important to their creative process, well its par of their art." LOL! Part of me is afraid I think that it will teach me to be too structured and that there are hard rules for what is art and what is not. I'm just now finding myself with bead embroidery and the fact that it can be what it is and NOT have to be perfect or done right. I much rather prefer to feel my art and let it happen as it goes than to fight with it to make it what some one else thinks is the "right version of art". I love your piece, Robin. I think it says what is right for your heart to express and holds it own as an artistic piece just fine. I thought about what you said. I would say I am let it come kind of person in my crazy Quilting. Although the sky is the limit there are always principals for most any art. But if there were "rules" who gets to decide what the rules are, wouldn't that fit under paint by number and pretty much all be the same art. Letting your heart speak in your work to me is what makes it art. A reflection of you who you are, what you are. 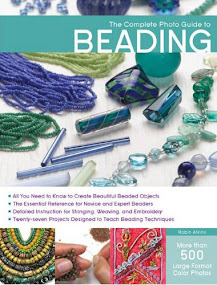 It is a beading "journal" right? Makes me think of a diary page, I sure hope no one would tell us how to write in our journals, they are all different. we all use a writing utensil, we all put words, but I am sure no two are the same or have rules to follow. I still love it the way it is! Robin, I love this piece and I really appreciate your post about it. I can relate to this, as I too am losing my mom. With Alzheimer's, I see her slipping away a little bit more each day, and it's absolutely heartbreaking. Regarding your piece, to me it has just the right emotional impact. It has a strong message, and that's one of the things I love about art. Had this piece been balanced differently, it would have had a different meaning, one that didn't have the same feel about it. I think you got it just right. I think it is learn from the piece and go on. The idea that emotions are very much a major part of relationships makes the words need to be there in that place and size. Thank you for this wonderful post. I enjoyed reading it. After many years of paying attention to what others thought of my art and "doing it right", whatever that meant, I am now happily letting it be, letting it flow. Working in a free-form way has been so liberating for me. I find that the art I create now, whether it's the free range knitting that I'm currently immersed in, my beadwork, my photography, my life - it is all authentically me and nothing could be more satisfying than that. I'm definitely in the "just doing it and letting it be" camp. The biggest problem I've had for years with any type of creative work is the voice in my head saying it has to be perfect and that there were rules you had to follow. Joining the BJP last year was really the first time I let myself create something and focus on what it meant to me, and not worry about how other people would respond. Aside from having a lot of fun, it helped free a lot of things inside me that needed to get out and now I don't listen to that critical voice much anymore. Another thought regarding 'doing your own thing' -- if you try to follow a certain style that you admire, or even follow all the rules -- you face the problem of being derivative (another term that seems to be bandied about in the art world). 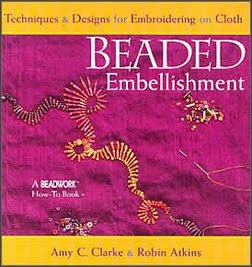 I love to be inspired by all kinds of art but when I'm beading I try to put that all behind me and create each piece as 'specific to me'. I think that creating your own style is much more important (not only to the art but to myself) than following the rules. I'm a do it your own way person. I come from a family of people who are very talented artists in various mediums. I avoided the drawing/painting avenue of art in school because it was too structured. I think the "rules" should only apply to a tecnique while you are learning it. Once you've learned it, what you do with it should be your own and not what others think it should be. This is a huge plus side of the BJP. 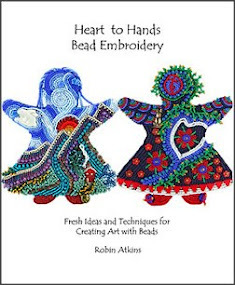 We all know the same tecniques on how to get our beads etc. on our pieces, it's how we put them together that makes our art what it is and thankfully so unique. My BJP efforts are always a battle between the "do it right" and the "let it be" approach. At the moment I am not capable of improvising a piece totally. And I get blocked by weird conceptions. For example in BJP 2009, for 3 months I was so absorbed by personal problems that I couldn't bead anything ; now I feel better, but I feel it is not right to bead retrospectivally.Oh well, I'll get there eventually. 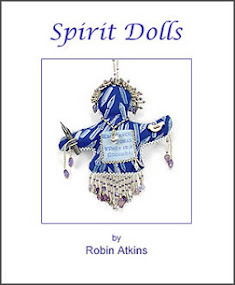 I am thankful to you Robin, as it is your beaded dolls who showed me the way to letting go. But I don't consider I am making art, rather creation is more like prayer for me. Robin...take all the time you need to absorb that mother love. I really like your February piece, and the slightly uncomfortable feelings it generates, not being centered or symetrical. 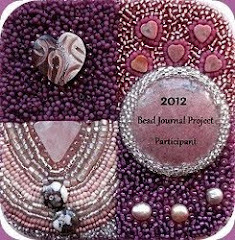 This Bead Journal Project is just for us--what we need to feel and express at a give moment in time. It is our present to ourselves. I'm completely in the Just Do It and Let it Be camp..at least for this project. Other projects or media, maybe not so much. Maybe we can allow ourselves to bend with the wind, like a willow tree. The problem here, as I see it, is that you're confusing "art" with "craft." In my mind, craftspeople work according to rules and end up with a consistent product. I admire them an awful lot. Their output is absolutely beautiful and they create works that are treasured for generations to come. Artists learn techniques and then apply what they've learned to what cannot be contained within their own mind. For me, I take lots and lots of classes because the more techniques I learn, the wider the options available are for expressing my artistic nature. But I almost never make what was taught in class more than once, if I make the actual project that they are teaching in class at all. 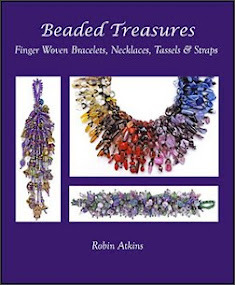 Robin, I took your beaded tassel class in Visalia and learned not only how to make tassels, but that beading was my true passion. I made a number of tassels to be sure, and then expanded the technique to jewelry. Applied what you taught me to my own knowledge of color blending, and then came out with my own product. 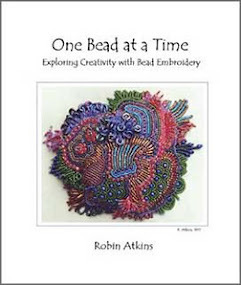 And as the years have passed, I've let myself go free to experiment and create with all sorts of materials with beads involved, and know that I am not making anything specific when I am doing true art as opposed to craft, which I also do. Rather, when I am pursuing art, a higher force channels itself through me and I'm often as surprised at the end product as everyone else. I believe that the same force was channeling itself through you when you made your heart BJP. It just happened, as you describe it. That's art. Some people like it, and some people don't. That's life. Art doesn't have to meet anyone's particular definition. All it has to do is evoke a response, positive or negative, to qualify. I've followed your blog and your work for a long time now. You are truly an artist that I admire and I'm only sorry that somebody's words made you question the validity of your work. Then, Robin, I guess one of the beauties of the BJP project is the J for Journal. With the journal aspect, we agree to make public our most intimate aspects, without thinking too much whether it is art or if it is beautiful or smart. We kinda just splurt it out. Later maybe we can use what we found through the journal aspect, in art or craft. Another great post Robin. I may end up copying it over into my studio journal for future reference. I especially love that you gave us a scale upon which we can figure out where we sit. I so admire your ability to help us be gentle with ourselves as we each walk our own path through art and creativity and spirit. I'm so happy that I met you Robin. Here I am doing art and not really worrying that it can't be art just because I never studied art. We're so used to putting judgement on the quality of things. Sometimes it's hard, but if I catch myself making judgements about my work, I remember that the only one I need to please is myself. A book that influenced me to let go of preconceptions about art is "Art and Fear" by David Bayles and Ted Orland. Sometimes I feel like I just can't do anything worthy. Then I reread this book. 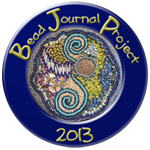 The journal aspect to this project is invaluable. Aesthetics,... yep, I am inclined to leave the academic debates to the critics. Two sides of the same coin and all that jazz. Artistic expression/ journaling comes from experience and soul, technique is just the vehicle. Yes, you teach technique, but as a leader you also put yourself out there and create a safe place for everyone else to publicly explore/share the depths of their experience. I am honored to be a witness to your art, life and teaching. Doubt is just a loose pip, fish it out and spit. I'm late to the conversation but I'll jump in anyhow. I try to make my pieces square if they are to be square or round if round. I try to finish off the ends neatly and not be sloppy about my beading. That's the rules. Then within that framework I can choose placement, type of beads and so forth with no worry as the parameters have been set and the piece will make me happy. You follow the rules of craftsmanship but allow your heart to bring out the art of it. That's my thought anyhow. 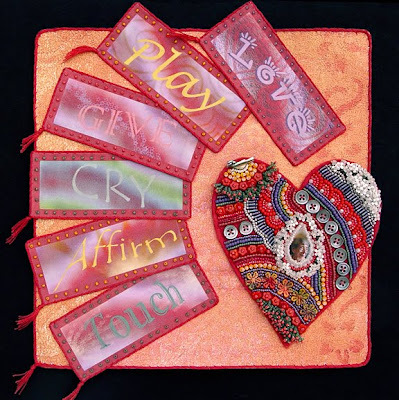 Cry ~ Feb Bead Journal Project ~ Finished!